Perhaps because of my intellectual and scientific sidedness in the nineties, among other things, my artistic inclination and the unconscious surprised me at the change of the millennium with a series of to me unusual dreams and visions, which sparked my interest in prehistory. The images that I saw referenced, when measured on a human life, to times long past. However, they resurrected, entirely unsought and unexpected, in my experience and began to concern me. First I took the pictures religiously, so overwhelmingly vivid were they. But I had too much experience with churches and theology, to stay with religious interpretations and to fancy me a prophet. The dreams and visions were mine and I understood that I had to figure out what they mean to me. This led me almost by itself to the analytical psychology of Carl Gustav Jung. What I learned on my quest for the meaning of these images for myself, only very possibly can take on meaning for others, too. Temple in Knossos, about 1700 B. C.
Essential in the whole series of visions and dreams turned out one initiating vision in the spring of 2000 and one dream in the summer of 2000. They dealt with what some call the ‘Triple principles of the feminine’, or the three appearances of the female. 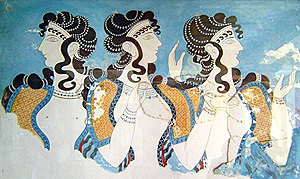 As depicted for example on frescoes in temples at Knossos. To make the vision and the dream possibly better understandable to the reader, I refer in my description to references that I rediscovered or found only in the subsequent years. The vision and the dream itself were ‘pure’, that is without the intervention of mediating knowledge and analysing and interpreting intellect. The visions and dreams came like an intuition, which is suddenly is there, without being able to say immediately from where and why. Only then does one rationalize and think and look for ways to explain, to frame the intuition within what one knows and understands already. Or if one cannot place her, one may look for new knowledge and frameworks in which placement becomes possible. At first I tried to understand the three-part vision and the three-part dream of the feminine religiously. Until a female therapist colleague drew my attention to the work of the perhaps most innovative student of Carl Gustav Jung, Erich Neumann. I began to understand that I had an experience of collective archetypes of humanity, which are anchored in the collective unconscious and act autonomously. This explains the intensity of the vision and the dream, which compared to a ‘numinous’ religious experience according to Rudolf Otto. Research and work of Neumann pointed me far back into a time before the current patriarchy, to a time of a matriarchy, as it probably survived longest on Knossos, and as it stood before the eyes of Bachofen, Gimbutas, Neumann and Kokoschka among others. This matriarchy existed much longer than the current patriarchy. I began to understand that this matriarchate is still present in the collective subconscious that I share with all of humanity, whether it be, as it were, in my genes or even non-spatially. I began to rethink femininity and to read about it to increase my understanding of it; and to understand my own masculinity also in the light of female archetypes. 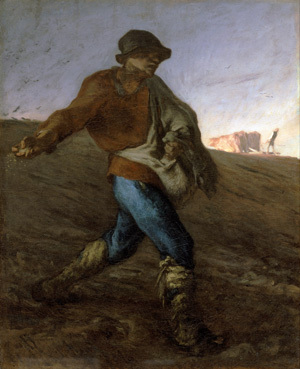 Then the image of the sower appeared. 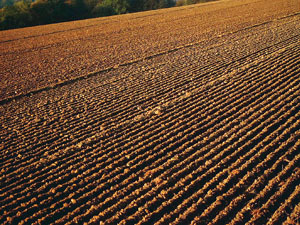 I saw myself going through a just ploughed, dark and moist furrow and to sow some of the seeds that I had received from her, the earth, back into her. From this point of view, masculinity also means to consciously receive from the Earth and to consciously give back to her again; also to be able to stay alive on her. (Neumann 1975, 1978.2003, 2004b; Gimbutas 2001 2001a, 2007; a. o. ).